You can’t help but know their name, as this top-rated name in the world of online gaming has been on the scene for well over a century. You might not be as familiar with their online offering dedicated to bingo (apart from perhaps having seen the Ladbrokes Bingo advert on TV), so we hope to give you the overview. UP TO £40 WELCOME BONUS18+. New customers only. Certain countries only. GBP, EUR & SKR only. Min deposit and spend £10 on Bingo within 7 days of reg. Bonus for Bingo only. 2x wagering req apply. Bonus valid for 7 days. T&Cs apply, see below. CLAIM BONUS 18+. New customers only. Certain countries only. GBP, EUR & SKR only. Min deposit and spend £10 on Bingo within 7 days of reg. Bonus for Bingo only. 2x wagering req apply. Bonus valid for 7 days. T&Cs apply, see below. Ladbrokes Bingo is a great site with plenty of options when looking for individual features to enjoy. They could rely on the branded name to drum up customers, but they promise a generous welcome offer regardless. There are plenty of ways to save money here and being in the big league makes them capable of building up humongous progressive jackpots. So with the right bonus code and welcome offer, you could have a chance at life-changing winnings for next to nothing! It’s not just about money though (as much as we’d all love to have more of the stuff), this trusted brand can give you better security and round the clock customer support. Then there’s the games catalogue, all of which has brilliant graphics and ranges from the latest online bingo to colourful slots. We wouldn’t call it perfect, but have to appreciate that they’ve sourced the best of the internet’s entertainment and brought it to you with the latest technology. They say hello to new players in the most wonderful way, with a welcome bonus to instantly boost your balance. All you have to do is register and pay £10, then they generously give you £50 to play with. It’s all very simple to get signed up and the bonus is instantly credited to your account, so there’s nothing time-consuming about grabbing this great offer. The only drawback is that there’s a seven-day time limit in which you need to spend that bonus and fairly standard wagering requirements. This shouldn’t pose a problem as you’ll want to get on with playing and the full terms and conditions are available on site. You’ll also get access to the guest room as a new customer, meaning you can join in with free bingo games and fun prize pots. Promotions for the site continue to impress, with offers worth scheduling your games around. Wednesdays brings free chat games for instance, with a chance to win great prizes, bonuses and tickets. There’s currently daily treats throughout December, but you’ll always look forward to Friday evenings, as using the bonus code FRIYAY unlocks a huge 300 extra loyalty points. You can also get double loyalty points on a Sunday, perfect at the end of the week when most people have more free time to play. These points can be converted into real cash for you to spend on their site, showing real appreciation for those returning customers. As a VIP member you can get even more rewards, such as 10% back on any losses. There are plenty of online VIP casinos available if you like the sound of these special loyalty promotions. As a major site they have so much on offer it could be overwhelming, but it’s all well laid out to simplify things. The bingo schedule helps you to plan ahead and make sure you catch all your favourite games (though some run round the clock), while promotions are listed to help you save money. Meanwhile, the chat games can set you on track to win extra bonuses. They also have brilliant bingo guides, to accommodate and inspire confidence in any new player. 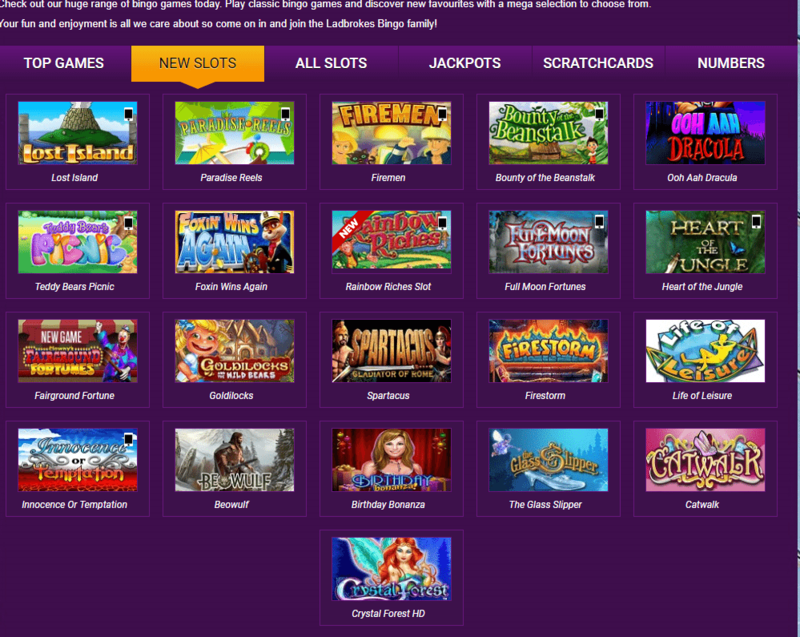 Some popular features you can find on different sites include Penny Bingo and Cash Cubes which many avid players enjoy. You can take your pick of classic (90, 80 and 75-ball) and themed games, or even play mini bingo games on the side at the same time. For something special, the interactive multiplayer version adds to the excitement with huge prizes, or you can try bringing your favourite TV shows to life, like Deal or No Deal online. As a major provider Ladbrokes Bingo are capable of bringing you enormous progressive jackpots, so signing up here could change your life. The only real downside is that they’re so popular, the bingo rooms can get crowded pretty quickly. There are so many slots to provide endless entertainment; something for everyone in the varied choices and many give you a chance at big money prizes. You may also get the options of free spins might to get you started, but you’ll definitely be returning. Basically taking a tour of the games catalogue on the site results in thrills aplenty! The Ladbrokes Company was founded in 1886 and adopted its name in 1902. Ladbrokes Bingo wasn’t launched until 2007. Since then it has grown into one of the UK’s favourite bingo site. The site is setup is reminiscent of a house, with a variety of bingo rooms such as the basement and the attic. 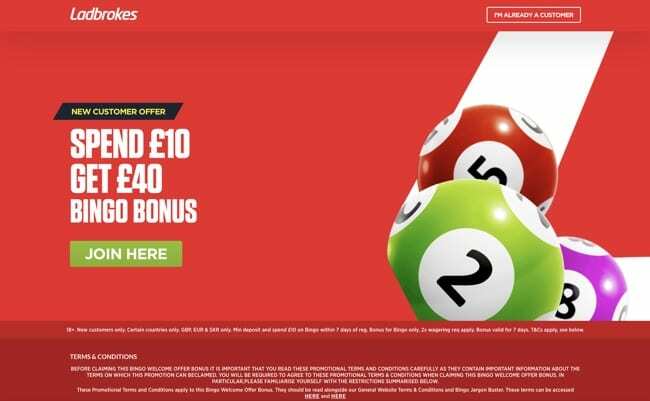 New players should find it fairly self-explanatory (just refer to the navigation bar topping each page) and seasoned players will appreciate the regular updates when using the Ladbrokes Bingo login. Games are powered by the Virtue Fusion software, so you can expect it to run smoothly with such a top-rated provider (they are popular for a reason). Slots are supplied by major players like NetEnt and MicroGaming, so you’ll have no trouble finding old favourites and trending hits of the online bingo community. They really do all they can to provide the best customer support, with a live chat feature working day and night. It puts you in touch with a company contact who will be knowledgeable and helpful, as they talk you through any queries in real time. The FAQ section is also quite comprehensive, so you may well refer to that and find all the information you require. If those options somehow don’t suit you then there’s email or their customer services.phone number is also working 24/7. Once you have created an account you only have to login, transactions can be processed securely and with simplicity. They endeavour to improve the site’s ease-of-use by procuring multiple payment options, for you to select the one most suited to your preferences. If you aren’t yet registered with one of these, you will be happy to know they accept credit or debit card, bank transfers and even cheques. You should be aware however, that some payment methods work for deposits but not withdrawals, so do check beforehand. Payments are instant but withdrawing winnings can take up to a week, although they will usually be processed before that. As they are licensed in the UK and Gibraltar, you can rest reassured that they maintain the high standards of security required by these strict authorities. The latest encryption software is utilised to make sure that your personal details remain personal. The same goes for their Ladbrokes Casino which is another part of the brand. They ensure that games are independently tested for fairness, as well as using a random number generator, reinforcing their status as a trustworthy brand. This site is not just about bringing the excitement of a real live bingo hall to your home via a desktop computer. You can access the site from a mobile via your browser for instant play whilst on the go, wherever you may be – or whenever you get a spare moment free. Mobile bingo games are wonderful, as all you need is a Wi-Fi connection to carry on a winning streak or make the most of dead time such as your daily work commute. If you want to fully optimize the experience, the Ladbrokes Bingo app downloads in minimal time and makes it super-accessible. This is geared up for Android or iOS system, therefore caters to Android, iPhone or tablet users – as long as they’re not a substantially older model. It’s not a letdown by comparison, running pretty much as smoothly as the desktop version. You’ll really be taken aback by the incredible HD graphics of numerous slots, so we recommend them if you prioritise a good viewing experience. The Ladbrokes Bingo Android app is perfect if you want an established name to go with your online gaming experience. The app is easy to use, it has a wide variety of bingo and Ladbrokes slots games, and the jackpots are out of this world. As well as Android devices, the app is also available for your iPhone. Play games from as little as a penny and earn loyalty points to gain access to special offers and bonus bundles. Installing the mobile iPad app will literally take two minutes of your time. Once it’s installed you can play 75 ball, 80 ball and 90 ball bingo to your heart’s content, wherever you like. There’s even free bingo on offer every day so download the mobile application now before you miss out on all that fun. If you want to play massively popular games such as Deal or No Deal and Dynamite Digger, then the Ladbrokes Bingo app download is the one for you. In the time it takes you to switch on your device you could have downloaded the app and registered your details, so what are you waiting for? You’re going to need to know how to get the mobile application if you don’t want to miss out on all that exclusive content and those amazing progressive jackpot games. Fortunately, it’s incredibly simple. To install on an Apple device just go to the iOS app store and download it from there. If you have an Android device, go to their site lobby and click on the bingo tab. Press ‘download now’ and you’ll be up and running in the blink of an eye. Some payments methods only work for deposits and withdrawals can potentially take up to seven days. So how do they fare? Overall we can’t fault this site, as a fantastic all-rounder for the avid bingo fans among us. They may be better known as a leader on the UK sports scene with the Ladbrokes sport betting site, but that doesn’t mean that there’s not been serious effort put into pleasing bingo fans too, as they’ve done so for over a decade. They make an impressive effort at the important things like offering a good choice of games and bingo rooms, but also pay attention to practical details like varied payment options and security. It’s equipped with fast-loading software that’s capable of giving you a great viewing experience on desktop, tablet or mobile devices.